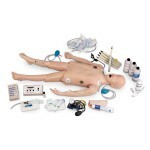 Everything you need in one manikin! 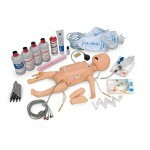 This dramatic, state-of-the-art training manikin is a complete resuscitation system designed for teaching life-saving techniques for infants. 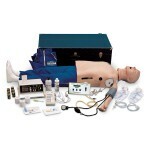 Ideal for pediatric advanced life support, nursing, hospital, paramedic, and EMT training at every level. 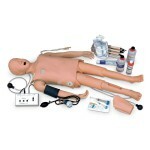 Tactile and visual realism combine to provide students with the most realistic training possible. The most comprehensive PALS trainer available, the manikin allows practice of 4-lead ECG monitoring, IV therapy, umbilical catheterization, airway management, intraosseous infusion, and CPR – all in one manikin! The unique chest skin with an umbilical cord allows practice of proper techniques in umbilical catheterization, including cutting and clamping. Fluid may be aspirated through the umbilicus, making this training manikin incredibly lifelike. An IV arm and leg allow for realistic practice of pediatric venipuncture. The cephalic and basilic veins are accessible on the IV arm, as well as the dorsal venous arch on the hand; the great saphenous veins are accessible on the IV leg, as well as the dorsal venous arch on the foot. An intraosseous infusion leg demonstrates and simulates the intraosseous infusion procedure. 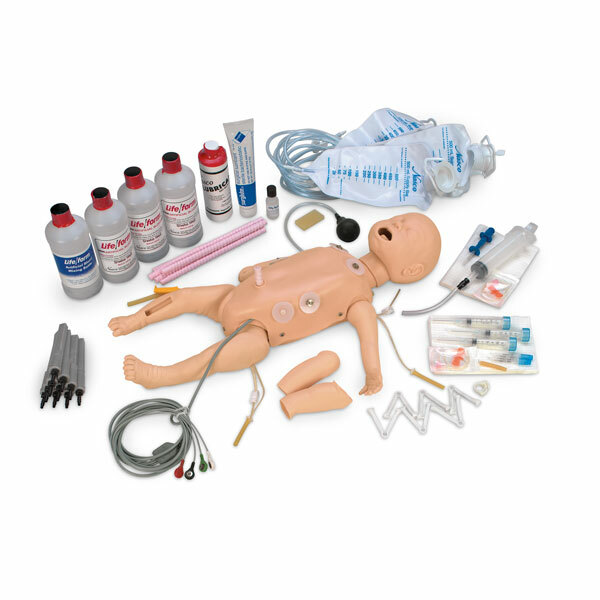 Featuring realistic anatomy and size, the airway management head is ideal for practicing airway management skills on an infant. Includes a hard carrying/storage case. Three-year warranty.